The Foundry Art Centre is currently looking to fill the full-time position of Education Manager. Creates curriculum's for classes, camps, and workshops held at the Foundry Art Centre. Schedules instructors to teach the classes as well as interview potentially new instructors. Prepares and modifies contracts between the Education Manager and Instructors. Collaborates with instructors on lesson plans and supply lists – ensuring the quality of the classes offered. Works closely with instructors while under contract for a class, workshop, and/or camp. Works with Administrative Coordinator to post all upcoming classes and online registration forms on the FAC website. Collaborates with Media Coordinator to design promotional material for the education program. Materials are mailed and emailed to past students and members. Coordinates with the Executive Director and Administrative Coordinator on marketing opportunities for the Education Program. Processes student enrollment and fees. Works within a budget to procure art supplies for all classes, camps, workshops and events. Keeps track of education program finances including check requests, invoicing and reporting. 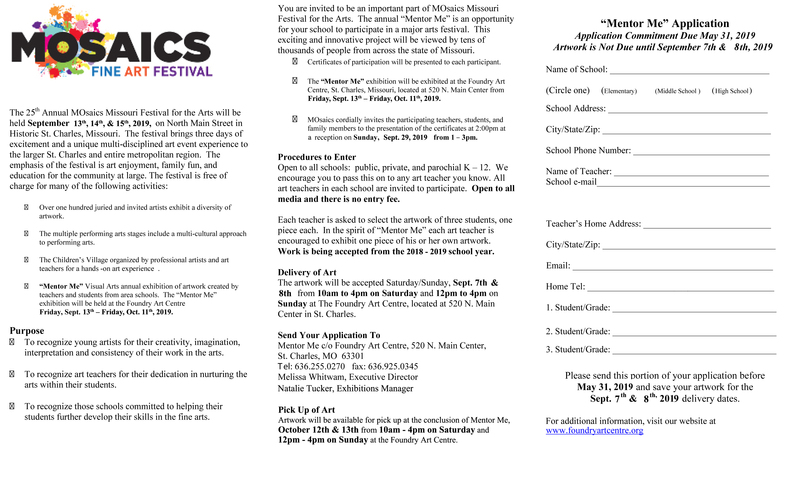 Responsible for coordinating and implementing art projects for the children’s area of two major festivals in St. Charles. Responsible for planning, coordinating and implementing free and ticketed children/family friendly events held at the Foundry Art Centre. Coordinates and manages exhibitions in the Baue Children’s Gallery. Creates hands-on activities for the Baue Children’s Gallery. Researches up-and-coming workshops, art mediums and instructors. Assists students and parents of students with any problems, concerns or questions regarding classes. Manages the Foundry Art Centre’s Community Classroom and ensures it is organized and clean. Organizes educational tours for school field trips and community groups. Collaborates with Studio Artists for activities and demos for the visiting groups. Partners with Exhibition Manager and Events Manager to develop educational workshops, gallery talks, and other programming in conjunction with current exhibitions and events. Assists Executive Director as assigned. Excellent communication skills: including but not limited to writing, proofreading and public speaking. Ability to manage multiple projects and assignments, working with a variety of staff and volunteers. Excellent work ethic and high expectations for quality. Minimum of Bachelor’s degree in art education, studio art or art history or significant work experience in the art field. Proficient using the latest versions of Microsoft Word, Excel, PowerPoint and photo systems. Flexibility of schedule; willingness to work weekends, evenings, special events, long hours and fill in when necessary. Willingness to go above and beyond listed duties. Employees are expected to maintain a clean shared work space and cooperate in maintaining facilities, setting up and breaking down events, etc. This position pays a salary and offers benefits. Interested applicants may send a resume and cover letter to Executive Director Melissa Whitwam by February 1 at melissa@foundryartcentre.org.